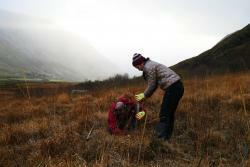 Organised by Neil Martinson, from the Snowdonia Mountain Hostel, over 400 native tree species were planted by the Bangor University volunteers. Explaining the importance of the work, Mr Martinson said: “We sourced the trees from the Woodland Trust as they are special ‘pioneer species’ which encourage other trees to grow. “We planted goat willow, holly, crab apple, hazel and birch; all indigenous species designed to withstand the brutal wind and rain we often experience here in Snowdonia – and which the students coped with wonderfully during the tree planting!” Mr Martinson added. Tree planting in the Ogwen ValleyDr James Walmsley, course director for forestry degrees at Bangor University said: “Our students learn about all about the planting of trees and forests; so it’s fantastic they get the opportunity to put this knowledge into practise. Forestry student and vice-president of BFSA, Chris Andrews, praised the Snowdonia Mountain Hostel and the university’s lecturers for helping organise the event. “We’re so lucky to be studying in such a fantastic location where we get to go out and be involved in reforestation projects like this. “And of course the home-made lasagne at the hostel went down exceptionally well after a hard day of tree planting!” Mr Andrews added. For more information on forestry go to www.bangor.ac.uk/natural-sciences/subject-areas/forestry.